The ATN ThOR-HD comes in four different versions, namely ThOR HD 384 1.25-5X, ThOR HD 384 2-8X, ThOR HD 384 4.5-18X and ThOR HD 384 9-36X. And all the four different versions of the riflescope come equipped with all the excellent attributes/features mentioned below. 1.11.1 There are also 2 Accessories that come with the ThOR HD 384 Thermal Scope. 1.12.1 Q. Who are the manufacturers of the ATN Thor HD 384 Thermal Scope? 1.12.2 Q. Does it come with a warranty? 1.12.3 Q. How much does this thermal scope weigh? 1.12.4 Q. What is the scope’s magnification? 1.12.5 Q. What are the dimensions of this device? 1.12.6 Q. How many batteries does the device operate on? 1.12.7 Q. Are batteries included in the purchase? 1.12.8 Q. Does the device come with an IR Illuminator? 1.12.9 Q. Can I use this scope with a bolt action rifle? 1.12.10 Q. Can the ATN ThOR HD 384 Smart Thermal Riflescope be used on a crossbow? 1.12.11 Q. What is the scope’s eye relief? 1.12.12 Q. What is the angle of view? 1.12.13 Q. What is the diameter of this scope’s objective lens? 1.12.14 Q. Does this scope come with a microphone? 1.12.15 Q. Is this scope waterproof? 1.12.16 Q. Can you sight this scope in the daytime? 1.12.17 Q. What are some of the mounts that are compatible with this device? With this very useful function, you don’t need to waste your time doing things such as memorizing charts, working complex calculations or guessing. The ATN’s Smart Range Finder will do all these for you. With only a few clicks and a quick shift of the scope, the Smart Range Finder will allow you to quickly range in on your target. After your target has been ranged in, the reticle sets to work by adjusting its point of impact. The end result of all this is an increased chance of making a perfect shot every time. Powered by the powerful Obsidian II Core, the ATN THOR-HD 385 Smart Thermal Riflescope has an excellent digital night vision technology that allows one to use the scope anytime– whether at night or during the day. The excellent Night Vision Mode allows you to see very clearly in the dark, thereby significantly enhancing your shooting experience at night or in low light conditions. This is a very useful feature for hunters who often hunt at night as it allows them to detect game easily in the darkness. 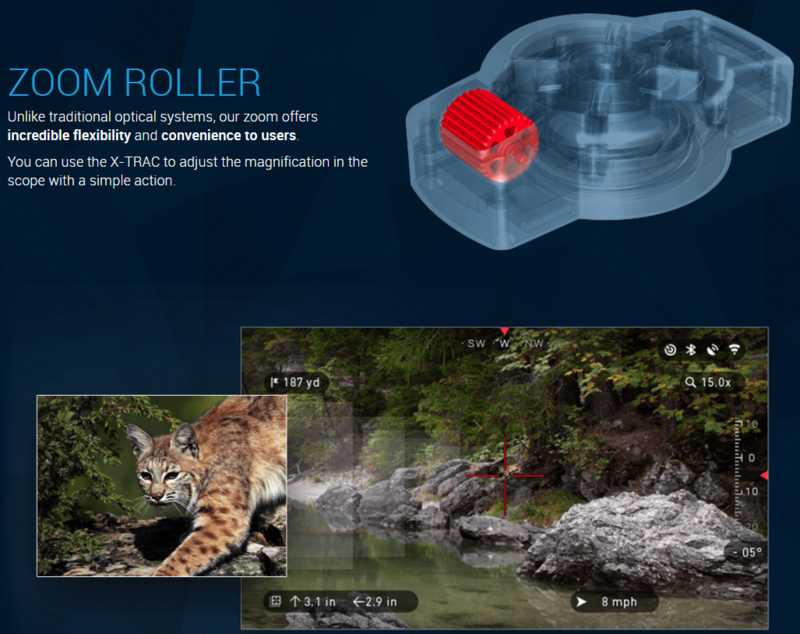 Another neat feature of the ATN THOR-HD is its Recoil Activated Video (RAV) function. With this feature, even if you forget to record your shot, the feature will remember and record it for you. This means that you can go about your hunting without bothering about remembering to press the record button. This inbuilt Recoil Activated Video (RAV) has the ability to record videos in 1080p during the day or during the night. With this feature, nothing can stop you from going home with videos of those once in a lifetime “perfect shots” which you can later share with your family and friends. 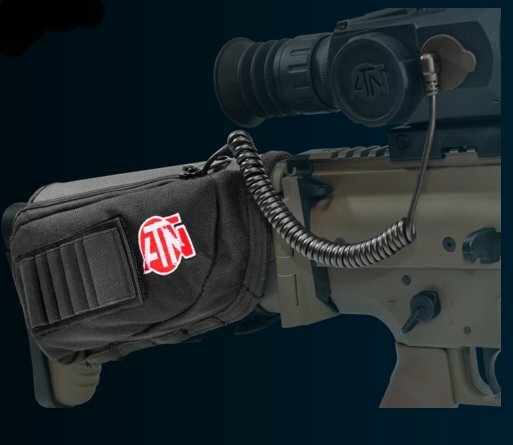 With the ATN Obsidian app that this scope comes with, you can connect the scope to via Wi-Fi or Bluetooth to any Android or Apple smartphone and watch live video streaming. You can also do other interesting things with this feature such as opening up the Gallery to either view your videos/photos or share them on social media or email them to your family and friends. Not too many scopes out there offer users the opportunity to get personal and up close with the things seen through them the way the ATN THOR-HD excellently does. This scope comes with a Smooth Zoom feature that will provide you with very clear up-close views of the things you are looking at. This makes your shooting experience more fun. The scope comes with several reticle patterns and color options that the user can easily choose from to enhance his or her shooting experience. Another cool feature that sets the ATN ThOR-HD apart from many of its counterparts is the free firmware updates that it comes with. It is common knowledge that firmware controls the behavior of your device. As a result of this, it is imperative that from time to time, you update your firmware so as to make sure that your device behaves or operates effectively all the time. Knowing how important firmware updates are, the manufacturers of the ATN ThOR-HD give users the ability to easily update the firmware on the device whenever new firmware is available. Regularly updating the firmware will do things such as fix bugs and add new features to the device, thereby making the ATN ThOR-HD perform at its peak all the time. Electronic Compass: This inbuilt E-Compass not only displays your current direction but also lets you know which direction you need to follow so you can get the best shot of the game you are tracking. E-Barometer: This gives you data about the current atmospheric pressure that is precise and accurate. Ergonomic Design: Since the manufacturers designed the scope with the user in mind, it is very comfortable to hold and use. Human Detection Range of 625m. Human Recognition Range of 280m. Human Identification Range of 170m. Like was mentioned above, currently there are four different versions of the ATN THOR-HD 384 Smart Thermal Rifle Scope. All the features/attributes discussed above are common to all the four versions of this bestselling device. Having said that, let us now quickly take a look at the most important attributes that make these versions different from one another. The ThOR HD 384 1.25-5X is similar to all the other 3 versions of the riflescope. The only major differences between this version and other three versions is the fact that features a smaller Objective Lens Focal Length that measures 19mm, a Magnification of 1.25 – 5X and an Angle of View of 16 x 125. The ThOR HD 384 2-8X is another version of the ATN ThOR-HD. This version is also very similar to the ThOR HD 384 1.25-5X with the only differences being that it comes with a larger and better Objective Lens Focal Length that measures 25mm, a Magnification of 2-8X and an Angle of View of 12 x 9.5. The ThOR HD 384 4.5 -18X is the third of the four versions of the ATN ThOR-HD. This version comes with higher specs than both the ThOR 384 1.25-5X and ThOR HD 384 2-8X. Some of the more sophisticated features that this version proudly showcases include a Magnification of 4.5 x 18X, a 6 x 4.7 Angle of View and a 50mm Objective Lens Focal Length. The ThOR HD 384 9-36X, which is the most advanced of all the four versions of the ATN THOR-HD 384 Smart Thermal Rifle Scope mentioned in this review, comes equipped with a 100mm Objective Lens Focal Length, which is significantly larger than that of the other three versions. In addition to this, the device features an excellent Magnification of 9-36X and an Angle of View of 3 x 2.4. It is water resistant and very durable. It produces very clear images. It has multiple reticle options for you to choose from. The scope has a Range Finder that helps you to easily range in on your target. It comes with a 1080p HD Micro-Display. It comes with an E-Compass and an E-Barometer. It features Micro USB and Micro-HDMI ports that can be used to connect the device to a computer or TV. It comes with GPS which can be used for things such as geotagging and elevation. The microphone that the device comes with enables you to record sound. It has an excellent ergonomic design, which makes handling more comfortable. The device comes equipped with the renowned ATN Obsidian app, which you can use to easily connect the device to your Android or Apple smartphone via Bluetooth or Wi-Fi. In addition to having a pretty long battery life, the scope also comes with an External Battery Pack. The manufacturers back this device up with a 3-year warranty. A number of customers have complained of the unit freezing occasionally. It can be pretty complicated to operate. There are also 2 Accessories that come with the ThOR HD 384 Thermal Scope. The first one is the ATN Power Weapon Kit. This Kit gives up to 22 hours of continuous use, it is easy to recharge and can help you power other devices. You can use the X Trac buttons to take photos and videos without the need to move your hands from supporting your weapon. This means that you can always keep your eyes on the Target! You can also use the buttons to access all other features the Thermal Scope has to offer easy and fast by using the scroll wheel and tactile buttons. 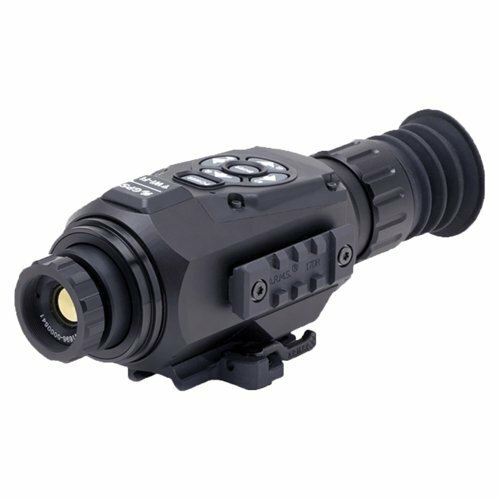 It can connect via Bluetooth to your Thermal Scope and it will help you control all the features and functions of the scope without touching the scope. It will offer incredible flexibility and convenience to all hunters! Q. Who are the manufacturers of the ATN Thor HD 384 Thermal Scope? A. The thermal riflescope is manufactured by one of the leading manufacturers of day/night vision devices and thermal imaging in America called the American Technologies Network (ATN) Corp.
A. Yes it does. The ATN Thor HD 384 Thermal Rifle Scope comes with a three-year warranty. Q. How much does this thermal scope weigh? Q. What is the scope’s magnification? Q. What are the dimensions of this device? Q. How many batteries does the device operate on? A. It runs on four AA type batteries (1.5V). According to the manufacturers, it is recommended that you use Lithium batteries. Q. Are batteries included in the purchase? Q. Does the device come with an IR Illuminator? Q. Can I use this scope with a bolt action rifle? A. If the rifle has a picatinny mount, then you can attach this scope to it. Q. Can the ATN ThOR HD 384 Smart Thermal Riflescope be used on a crossbow? A. Yes. You can mount this scope on a crossbow if you have a picatinny rail. Q. What is the scope’s eye relief? Q. What is the angle of view? Q. What is the diameter of this scope’s objective lens? Q. Does this scope come with a microphone? Q. Is this scope waterproof? A. The scope is weather-resistant. What this means is that despite the fact that the scope is capable of resisting water, it is not water proof. For example, while it has the ability to survive certain downpours, immersing the entire device into water can damage it. Q. Can you sight this scope in the daytime? A. Yes, it works excellently both during the day and night. Q. What are some of the mounts that are compatible with this device? A. The following mounts are compatible with the ATN THOR-HD 384 thermal rifle scopes : A.R.M.S.® #17® (single lever), LaRue LT270, A.R.M.S.® #35® (double lever) and American Defense (AD-170). If you are hunting for outstanding value on the thermal rifle scope market, you should definitely consider any of the versions of the ATN THOR-HD 384 Thermal Rifle Scope. Regardless of which version of the scope you purchase, you are going to end up owning one of the most versatile and technologically advanced thermal scopes on the market equipped with all the useful attributes you could ever hope for in a thermal rifle scope. And to make things even better, the manufacturers of the ATN THOR-HD back it up with a 3-year warranty, which just goes to show you the amount of faith they have in the quality of their device!